What are they? : Fiddleheads are the young, coiled, fronds of the ostrich fern. They grow wild in wet areas, typically in the Northeast region of the United States, predominantly in Maine. As they’re only available for a few weeks of the year – between April and May depending on the growing season – they’re considered to be somewhat of a delicacy. Where can I find them/What do I look for? : I found mine at Wegmans, and in the past have seen them at various Farmers’ Markets. You can also forage them if you know what to look for . Whether purchased or harvested, fiddleheads should be tightly furled, and bright green with very little to no discoloration. The photo below was taken pre-wash and before I removed some of the papery brown chaff, so while they look dirty here, they were in tip-top shape once cleaned. Fiddlehead ferns are unique by their appearance, taste, and nutrition profile. The curly young shoots carry just 34 calories per 100 g. Nonetheless; their high-quality plant-nutrition profile consists of health benefiting antioxidants, vitamins, and omega-3, omega-6 essential fatty acids. Fresh fronds are very high in antioxidant vitamin-A, and carotenes. 100 g of fiddleheads hold 3617 IU of or 120% of recommended daily requirements of vitamin-A. Vitamin A is a powerful natural anti-oxidant and is required by the body for maintaining integrity of skin and mucusa. It is also an essential vitamin for vision. Research studies suggest that natural foods rich in vitamin A help the body protects against lung and oral cavity cancers. They are an excellent source of many natural poly-phenolic flavonoid compounds such as a and ß-carotenes. Carotenes convert into vitamin A inside the body. Their unique sweet taste comes from their richness in vitamin C. 100 g of fresh fronds contains 26.6 mg or 44% of daily-required levels. Vitamin C is a moderately potential water soluble anti-oxidant. Together with flavonoid compound like carotenes, it helps scavenge harmful free radicals, and offer protection from cancers, inflammation, and viral cough and cold. Fern shoots are a very good source of minerals and electrolytes, especially potassium, iron, manganese, and copper. 100 g of fresh shoots contains 370 mg or 7% of daily-required levels of potassium. Potassium is a heart friendly electrolyte, which helps reduces blood pressure and heart rate by countering sodium effects. Further, they contain small to moderate levels of some of the valuable B-complex group of vitamins such as niacin, riboflavin, and thiamin. What do they taste like? : Fiddleheads are often compared to asparagus, but I think they also have some of the bitterness of broccoli and the snap of green beans. Basically, they have a flavor all their own! They also have a very “green”, grass-like component to them, if that makes sense. What do I do with them? : In this case fresh is best, and simple preparations are the way to go. Avoid eating them raw as certain – though rare – cases of food poisoning have been attributed to fiddleheads in the past. Boil them for at least 10 minutes (up to 15 minutes) as a best practice, and you’ll be in the clear! Trim the leeks lengthwise, then cut into 1/2″ slices. Wash thoroughly, making sure to get any dirt between the layers. Dry and set aside. Thoroughly wash the fiddleheads, removing any brown bits inside the whorl, and trimming any brown edges and mushy parts. Dry and set aside. Bring a quart of water to a boil. Lightly salt, and blanche the fiddleheads at a rolling boil for 1 minute. Drain and set aside. In a large nonstick skillet, toast the pine nuts until golden brown, set aside. To the skillet, add 1 TB butter and 1 TB olive oil over medium heat. When the butter has melted, add the garlic and let cook for 1 minute, but don’t let the garlic brown. Add the leeks, add a generous pinch of salt and cook, stirring frequently, until leeks begin to turn soft, about 8-10 minutes. Add the fiddleheads, another generous pinch of salt, and cook for another 5-6 minutes, until the fiddleheads are crisp-tender and beginning to brown on the sides. Add a little pasta water, if making pasta, or a little broth, enough to loosen everything up. You can add more olive oil, if desired. Taste for seasoning. Dish onto pasta, polenta, or whatever you’re using, top with crumbled goat cheese and pine nuts, and serve. 1. Bring two large pots of salted water to a boil. In one pot, blanche fiddleheads, as you would fresh asparagus, 2-3 minutes or until crisp-tender. Drain in colander and reserve. Meanwhile, bring a large pot of salted water to a boil and cook noodles according to package instructions, or until they are tender yet firm. Drain and toss with 1 tablespoon olive oil so they don’t stick together. 2. Heat remaining olive oil in a large sautÃ© pan to medium heat. Add tomatoes to pan and cook until they are just beginning to wrinkle. Add fiddleheads to pan and continue cooking until tomatoes are just beginning to collapse and release their juices. 3. Toss vegetables with pasta. Season to taste with kosher salt, freshly ground pepper and Parmesan and serve. Place the fiddlehead ferns in a large bowl of ice water, and soak for a few minutes. Drain the water, and repeat as necessary until any dirt and particles have been removed. If your fiddleheads have any brown papery chaff on the exterior, remove that as well. Bring a pot of water to a boil. While waiting for the water to boil, prepare a separate bowl with ice and cold water. Add the fiddleheads to the boiling water, and cook for approximately 10 minutes, until tender. Remove the fiddleheads from the pot (The water may be dirty! It’s okay!) and immediately place them in the ice bath to prevent them from cooking any further. Melt the butter in a skillet set over medium heat. Add the garlic and the capers to the pan, and cook for 2 minutes. Add the fiddleheads to the pan, and cook for an additional 2 minutes. Remove from the heat and toss with the lemon juice and Parmesan cheese. Serve immediately. If making with the pasta: Cook the pasta according to package directions [in a separate pot]. while you are boiling the fiddleheads. Melt 3 tablespoons of butter instead of 2, and cook the remaining ingredients as listed. 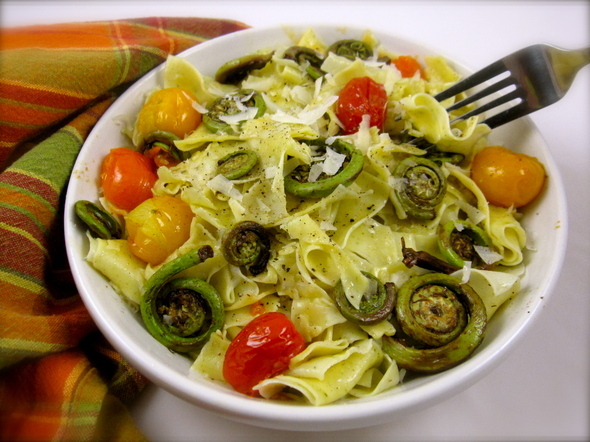 When you remove the fiddleheads from the heat, toss in the cooked pasta, before adding the lemon juice and cheese. Enjoy! ENJOY TRYING SOMETHING NEW THIS SPRING! !